I was going to see Brooklyn anyway. 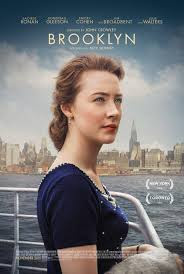 It's rocking 98% fresh with critics at Rotten Tomatoes and has been discussed for Academy Awards for Best Picture and Best Actress (for Saoirse Ronan as the young Irish immigrant, Eilis). Then friends mentioned that a priest plays a prominent role in the film, so I knew it might work for Movie Churches. Viewing the film, I discovered it not only had a church, but a church Christmas scene, so it would fit with this month's Yuletide Theme; a big win all around. The film opens in Ireland in the early 1950's, and one of the first scenes is set in a church worshiping with a Latin Mass. The church is full but many seem bored in the service. After Mass, a number of people go from the service to the little store where Eilis works part time. Employment options are limited in her small town, so when the opportunity arises, she decides to go to America to find work. Eilis' immigration plans are coordinated by a priest in Ireland and a priest in Brooklyn. The priest in America sponsors the woman, arranging for her lodging and employment in her new land. Father Flood (played by Jim Broadbent) is an Irish immigrant as well, from the same town in Ireland. He remembers Eilis and knows she has potential. There is one other important scene in the film that takes place in a church. There is a wedding. Often I don't give much attention to church weddings at this blog because often the scene could just as well take place at any venue. But the wedding scene in this film provides the important thematic and plotting function of reminding a character of the sacredness of wedding vows. You probably can still catch Brooklyn in a theater near you. 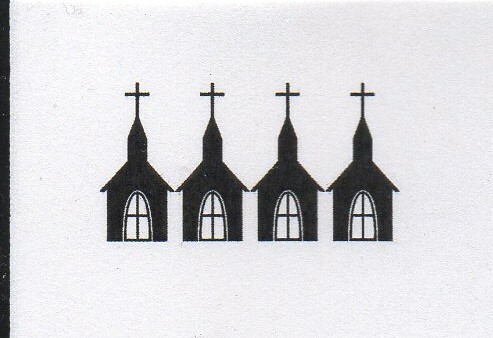 I'm giving the Movie Church in the film Four Steeples. So, there. The last Movie Church of 2015. Thanks to all who have read the blog through the year, especially those of you who have provided reactions and comments. In 2016 we will be adding a couple of features. On Thursdays, we'll continue to post about a Movie Church fitting into the month's theme (among the themes next year: comedies, cops and robbers, depression, and crises) In addition, there'll be other posts related to an adventure my wife Mindy and I are taking next year. During 2016, we plan to travel throughout America, visiting a church and a bar in each of the United States. Every week, we'll view a film related in some way to the state we are visiting, and we'll post about that. And if we go to movie theaters on our journeys, we may post that here as well. So a Happy New Year to all, and we look forward to having you along for the ride in Movie Churches 2016!